Someone asked me for a good home made muesli bar recipe this week and I think this one looks pretty good. Commercially produced muesli bars can be loaded with sugar and saturated or even hydrogenated fats and often don’t contain any natural fruit. 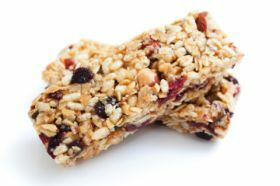 Homemade muesli bars are a healthy snack you can put in your kid’s lunchboxes each day. You can be sure of the ingredients and you can add your own touches. In a large bowl mix together the oats, sunflower kernels , almonds, flour, apricots and sultanas. Press into a greased and lined baking tray and bake for 15 minutes at 180 degrees C.
Cut into slice when cooled. Enjoy! Just make sure there are some left for the kid’s lunches. Just made these, and they look fab! Nutritious and tasty at the same time.